TORONTO -- The general managers will hold their first meeting of the 2011-12 season Tuesday in Toronto, and it is likely that the 1-3-1 forecheck utilized by the Tampa Bay Lightning will be a hot button topic for discussion. 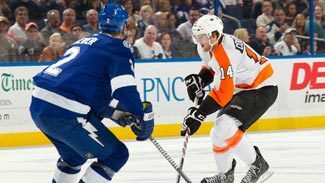 The Lightning's version of the patient forecheck became a League-wide conversation piece last week when the Philadelphia Flyers opted not to attack it but instead sit back and wait. Tampa Bay chose not to attack either, but instead wait for the Flyers to attempt to move the puck up the ice. The officials had to blow the whistle to stop the play because nothing was happening; the puck had stopped moving. "There has certainly been a lot of debate over the last few days about what happened in the game," Flyers GM Paul Holmgren told NHL.com Monday night from the Hockey Hall of Fame inductions. "Coaches do different things and their ultimate job and task is to win the game. Personally, I didn't have a problem with what Tampa did. They sit back and wait and they have great offensive players so if you turn the puck over they can hurt you. There was a period of time in the first period where we didn't bite into it and were doing our own thing, but to me it just didn't sit right." Holmgren is ready for the discussion, but he isn't sure if anything can come of it at the general managers' level because, as he said, "How are you going to mandate how teams forecheck and how teams attack? How are you going to do that?" Lightning GM Steve Yzerman told ESPN.com that he thinks it is worthy of a discussion and that he's looking forward to having one. Dallas' Joe Nieuwendyk, who was inducted into the Hall of Fame on Monday, joked with NHL.com that he anticipates it becoming the Yzerman and Holmgren show at the meeting Tuesday. "It'll be interesting," Penguins GM Ray Shero told NHL.com. "We played against Tampa in the playoffs last year and lost in seven games, and they played the same system. I have some thoughts, but that's the great thing about having these meetings -- you hear ideas from other general managers in the League and you kick things around. "I talked to our coaching staff and some of our players about it, what they thought, and really I'm not exactly what can be done about any defensive or forechecking system. The game is the game. If there are some great ideas I'm all ears. We'll see what comes out of it." The 1-3-1 is only part of the agenda. The other two main items on the agenda include an update on re-alignment from NHL Deputy Commissioner Bill Daly, and a review of the edited rules on boarding (Rule 41) and illegal checks to the head (Rule 48) from Brendan Shanahan, NHL Senior V.P. of Player Safety and Hockey Operations. The wording of both rules was altered prior to this season along with the addition of a minor-penalty element to Rule 48. While the re-alignment issue is without question the most sensitive because of how it could affect each team, Daly is expected only to give an update to the general managers because re-alignment is a Board of Governors agenda item. The Board of Governors are expected to vote on re-alignment at their meeting Dec. 5-6 in Pebble Beach, Calif.
Re-alignment is necessary because NHL Commissioner Gary Bettman has stated that the Winnipeg Jets will not play in the Southeast Division beyond this season. Columbus and Detroit have expressed interest in moving to the Eastern Conference. "At the end of the day like with anything, it's almost like supplemental discipline -- you can't please everybody," Shero said. "I think having it on the agenda at the managers' meeting is important. When I go back I can compare notes with Mario Lemieux and Ron Burkle, our owners, and our CEO David Morehouse. I can say, 'Here is where we are the GM level, here are our feelings.' The more information we have the better off we all are." Still, it is possible that the discussion on the 1-3-1 defensive system used by Tampa Bay coach Guy Boucher will dominate the day-long meeting. "There were times last year when we did it; not on the consistent basis we did in the first period the other night," Holmgren said. "I was at a game last year when Buffalo was in Tampa and Buffalo did the same thing. Washington tried it early in the year against them. But, sooner or later you have to try to score a goal, too. I think it'll be an interesting debate, but I don't expect anything to come out of it."